Who needs real pumpkins anyway? Real pumpkins get old and they start looking like really really old people, caving in and getting all wrinkly. Then before you know it, they're molding. Or worse, some teenage punks have thrown them against your house! You took time out of your day to carve that thing! You put a smiling Jack O Lantern right there. You scooped all those pumpkin brains out along with all those seeds, and some kid just goes and smashes it? It's not right! Pumpkin's are nature's smiley faces (you know, after we carve a face in them). So enough of that nonsense. There's got to be a better way, to be a pumpkin that can last all year long in even the harshest conditions. That's where we come in. Here's a pumpkin that you don't have to carve! It won't ever rot and it doesn't even have a big goopy mess of brains and seeds inside. Instead, you can wear this pumpkin every single day as you celebrate the happiest face of fall! And haven't you always known deep down that orange was really your color? So why not orange with a face on it! 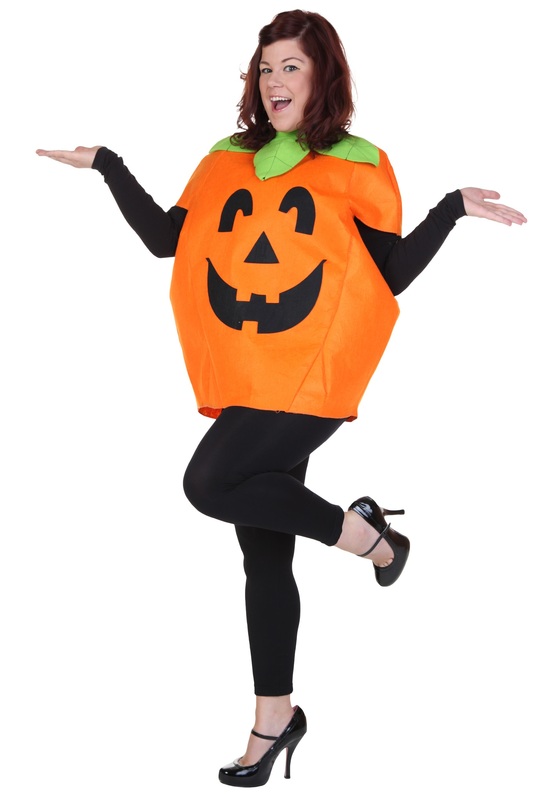 And an added benefit is that this outfit will definitely scare away any unwanted ghosts and goblins who are thinking of haunting you. One look at your orange pumpkin face and they'll be calling the Ghostbusters themselves! As long as no fairy godmothers try to turn you into a carriage, you'll have nothing but fun times in this pumpkin outfit.